Like a lot of women, Audree Kopp used to wear hair ties around her wrist without thinking twice. But last month, in the midst of the chaos of moving into a new home, she noticed a growing bump on her wrist. "It just kept getting bigger and redder and worse," she told CBS News affiliate WLKY in Louisville, Kentucky. Kopp went to her doctor, who gave her antibiotics. But the bump continued to grow, so she went to the hospital where doctors needed to perform emergency surgery. "They said I needed surgery, and thank God I caught it in time, or I could have had sepsis," Kopp said. "She had a large abscess on the back of her wrist, so I basically made an incision and drained the puss all the way down," said Dr. Amit Gupta at Norton Healthcare. Gupta said bacteria from Kopp's glittery hair tie likely got under her skin through her pores and hair follicles, causing three types of infection. 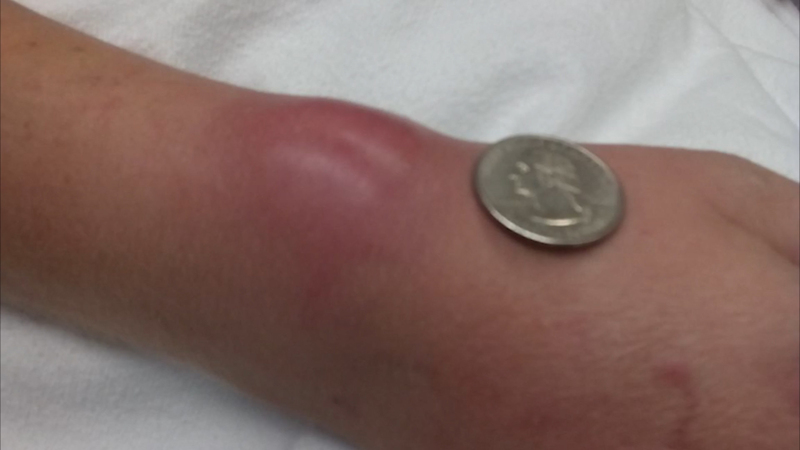 "I didn't believe it at first, I thought that it was a spider bite, or something else, not from wearing hair ties," Kopp said. Though Kopp's infection is rare, doctors recommend making sure hair ties aren't too tight around the wrist and not leaving them on for long periods of time. Washing them regularly can also help, as some of the material can collect bacteria, which can get rubbed into the skin. Kopp said she won't wear hair ties on her wrist anymore, especially ones that are tough to keep clean. And she's thankful her story had a positive outcome. "It could have been a whole different ballgame, once it gets into your bloodstream, people have been known to go into a coma, your body shuts down it could have been way worse," she said.